Reachel Davies, author of “Agile Coaching”, with ten years of experience in XP, Scrum and Agile (seven on the board of directors of the Agile Alliance), and 19 overall in IT, is a serious girl in this industry. Funny, I'd think she has some psychology background, but no, she's an engineer to the core. I'd think that because her presentation made so many points on the psychological part of our line of work, that my sister (who is a psychologist as well as a jazz singer) may be interested. 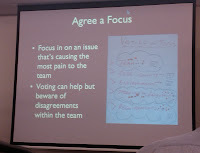 Her talk was about the underestimated art of retrospectives in our agile methods. Teams tend to forget about it or do it a wrong way, while it's the main thing that can help them get better. 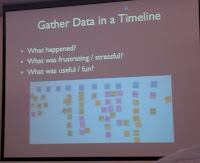 That can give you a very interesting insight in what was happening during the project. She also pointed out that people's moods take a big part in the efficiency of the team, and to have a valid historical view, you should include them as well (like biorhythms). To get that, anything would be good, from putting your spirit level on a scale, up to drawing a picture. Back to kindergarten anyone?. That may seem silly, but the team is the most important part of the project, and as such, we need to pay attention to everything that happens within. 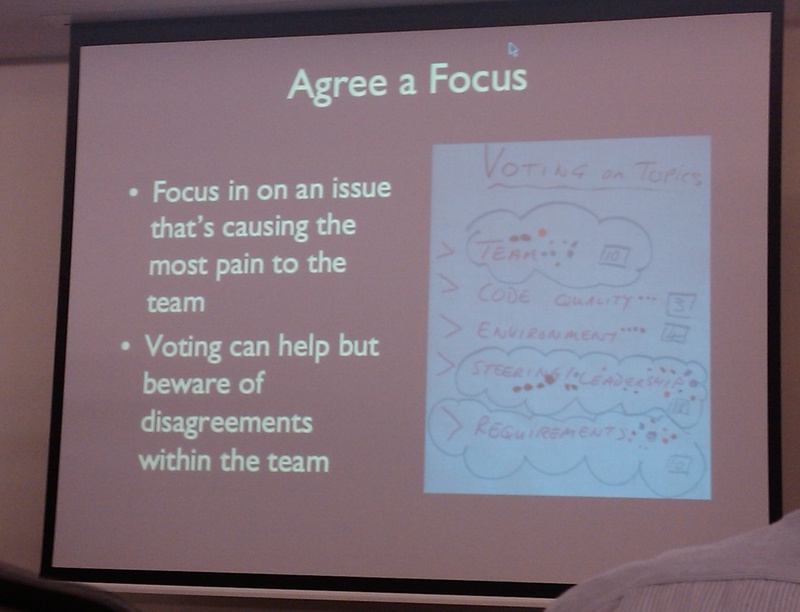 For example, while voting on things to change during a retrospective can help, we should beware of serious disagreements. There are things, like personal values, that you cannot change with a simple statement, and there are things (personal values again for example) for which people would rather be fired than give up on. That was pretty familiar to me, as I cannot agree to include chaos and lose quality for the sake of other things. And don't talk to me about quality versus work performance dilemma. It's a myth. You'll never be faster by writing uglier. In the long run, bugs and accidental complexity will bring you down big time. 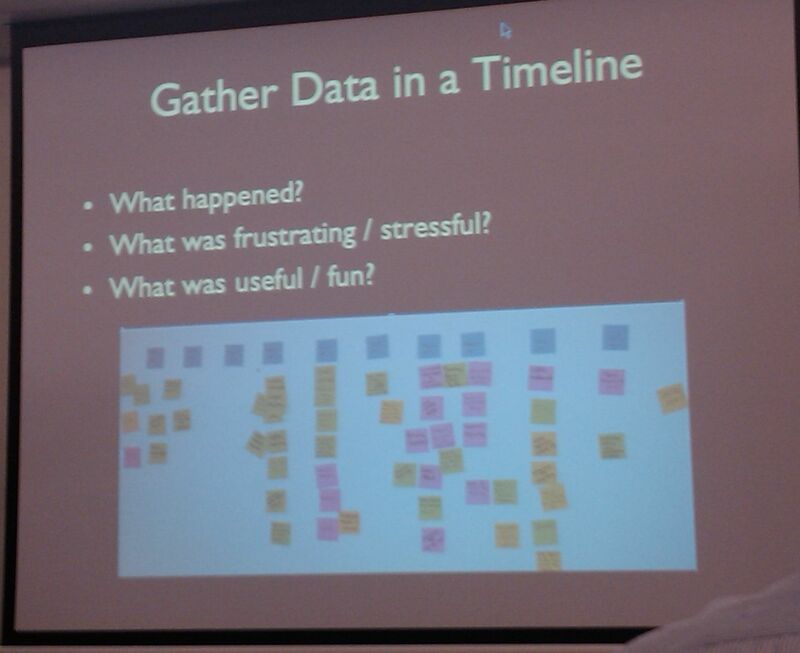 It's quite an interesting twist to think about retrospectives in a more general sense. You can (should?) use them outside of IT as well. About three years ago, I've been to a sailing camp at Mazury where my trainer, who was a youngster, after every not-so-perfect maneuver, would ask: “What went wrong?”. As simple as it is, the question generated a lot of afterthoughts that helper us pass the exam in the end. Now, think for a while, what else could also benefit from a well performed, regular retrospective?